No one wanted to play with the ugly duckling. He was so sad that he decided to run away from home. Guess what happened when he saw his shadow in the river? The three little pigs were happily building their own houses. What would the hungry wolf do when he found the three little pigs? See how the magic golden goose makes the serious princess laugh. Story: Rewritten from western fairy tales. Age: Recommended for Grade 1 students. Level: Helpful Chinese reading for basic level learners. Characters: Contains 1800+ basic level Chinese characters. Animation (Traditional): Story animation with Traditional Chinese subtitles. 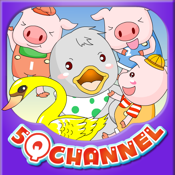 5QChannel has over ten years of experience in Chinese learning content development, and has published over 3,000 multimedia Chinese learning contents on the web. We specialize in using computer animation to transform classic Chinese literary works into captivating multimedia for the modern audience. Our products are educational in nature, and our aim is to help all readers around the world to read classic tales easily. We understand the difficulties children have in reading these classics in their original form. By reinterpreting well-known classic stories and creating a new way of learning and studying with multi-media devices, we provide a means for people to watch animation anywhere and anytime. We create digital reading with animations and thus the concept “Watch Animations and Get to Know the Classics” is realized.